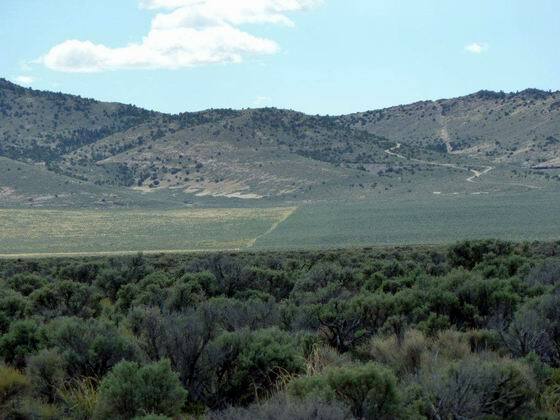 In April of 1846 Lansford Hastings rendezvoused at Johnson’s Ranch, northeast of Sutter’s Fort, with his old friend James Hudspeth who had traveled with him on their 1842 overland trip to Oregon, and the old mountain man James Clyman. 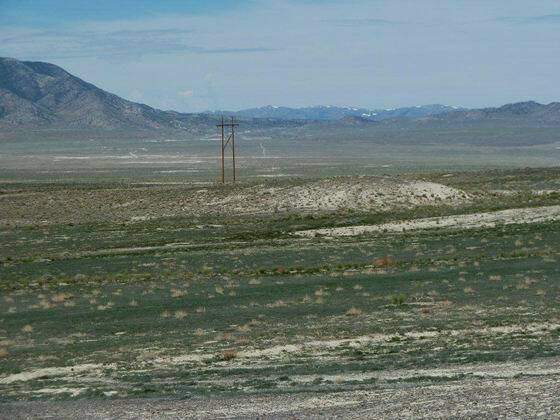 They were going to conduct an exploring trip east to fulfill Hasting’s scheme of finding a new, more direct route for drawing thousands of emigrants to California. 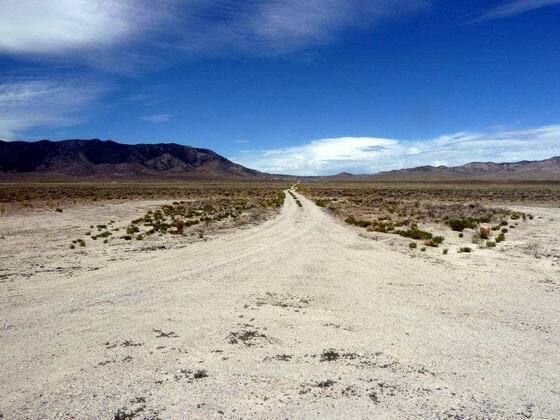 On May 21, 1846 the Hasting’s party arrived at the location near Halleck, Nevada on the California Trail that Lt. Talbot and some members of Fremont’s Third Expedition had reached by going through Secret Pass the previous year. The next day, after Hastings had convinced Clyman that they should check out the route to Salt Lake, the party headed east through Secret Pass. 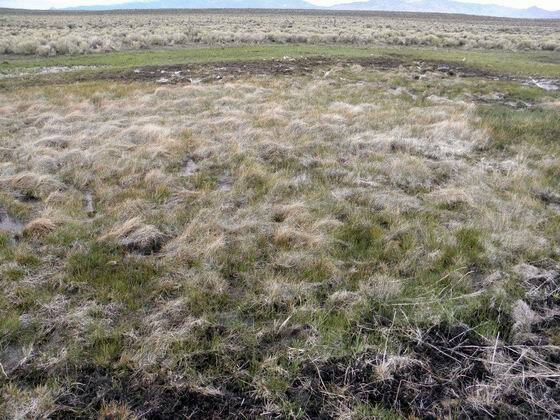 They followed the tracks of the Lt. Talbot-Joe Walker expedition east as far as Mound Spring. 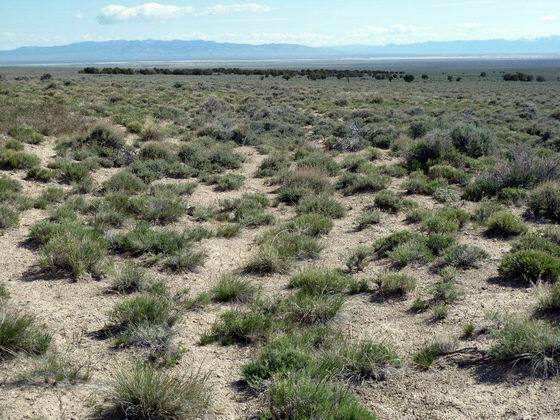 From Mound Spring they followed Fremont’s Expedition tracks to the Great Salt Lake Valley. From the Valley the Hastings-Clyman-Hudspeth pack party worked their way northeast through the Wasatch Mountains to Fort Bridger. At this point, Clyman parted company with Hastings and Hudspeth. 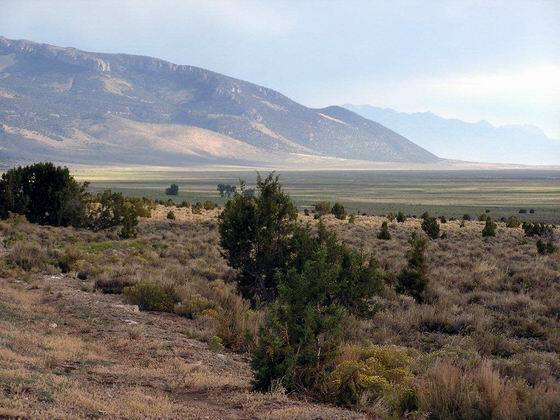 Still determined to carry on his plan, Hastings hurried eastward to the South Pass area to recruit westbound emigrant parties willing to try his untried “Cutoff.” In mid July, 1846, three wagon trains and the Bryant-Russell pack party showed up at Fort Bridger to take the new cutoff trail. 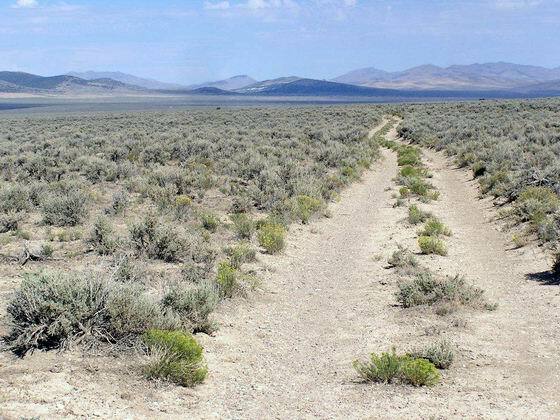 After leaving Fort Bridger, Hastings and James Hudspeth (who was assisting Hastings as a guide) scurried back and forth between the three wagon companies and the packing party as they did their best to guide them to the valley of the Great Salt Lake. 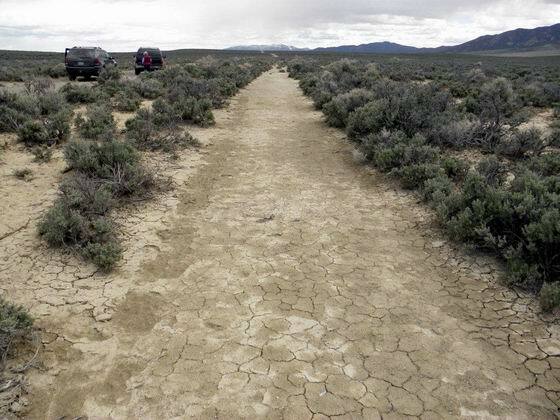 After arriving safely there, the next leg of the journey was west across the salt flats to Donner Spring located just east of Pilot Peak. 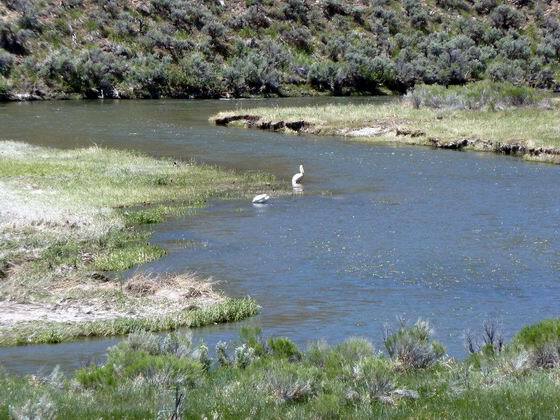 After a difficult trip across the Salt Lake Desert, the emigrants recruited their livestock at the spring and took a short rest before the next leg of the journey. 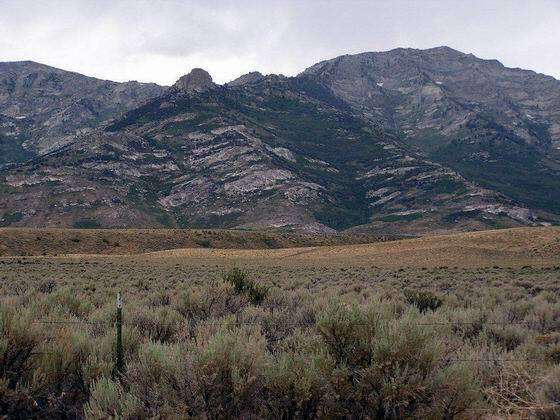 From Pilot Peak, Hastings guided the wagons generally west and along the route of the 1841 Bidwell-Bartleson Party as he went from spring to spring over to Ruby Valley which was located along the east side of the Ruby Mountains. 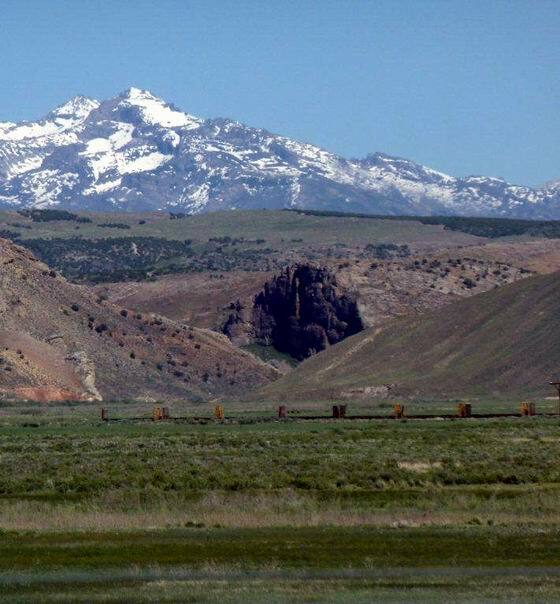 Since Hastings did not think he could not take the wagons over Secret Pass in the Ruby Mountains, he was forced to swing around their south end and cross over them at Overland Pass. 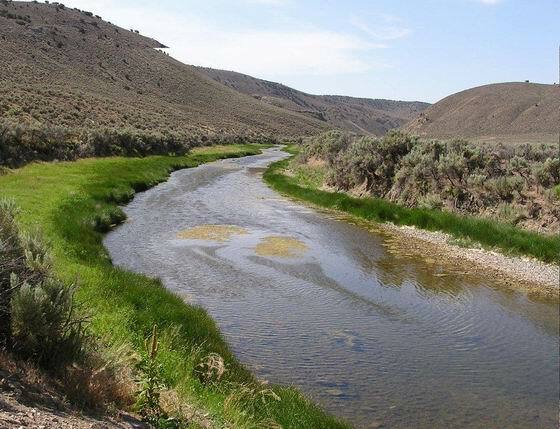 Next he led the wagons north along Huntington Creek to the South Fork of the Humboldt River, down through the South Fork Canyon and finally tied in to the California Trail along the main fork of the Humboldt River about ten miles west of present Elko, Nevada. 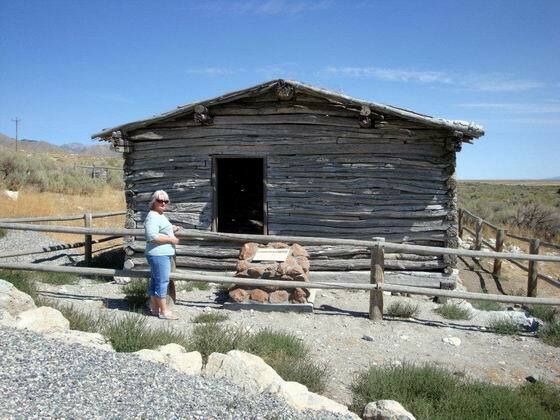 After crossing the Great Salt Lake Desert, the emigrants rested for a short time at Donner Spring before continuing their trek west over the mountains through Bidwell Pass south of Pilot Peak. Photo by Bob Black. 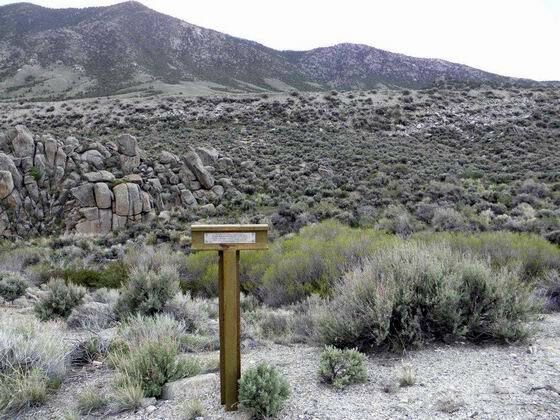 After leaving Donner Spring, the emigrants traveled southwest as they headed toward the pass in the mountains south of Pilot Peak. This photo shows a section of original trail near Munsee Spring. Photo by Bob Black. This section of trail (doesn’t show up in the photo) is marked by white Carsonite posts as it heads west toward Bidwell Pass. Photo by Bob Black. 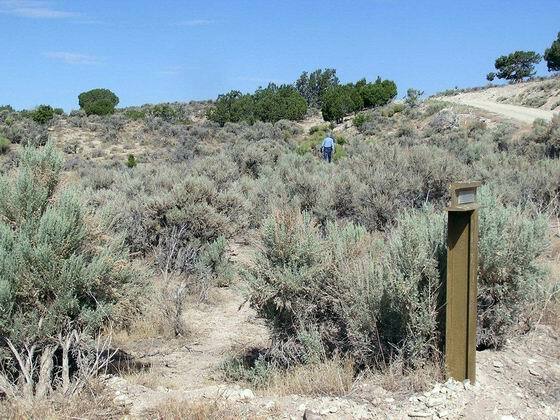 From the interpretive signs along the county road, the original faint trail heads southwest toward Bidwell Pass. Photo by Bob Black. The trail heads west from Bidwell Pass toward Marker HN-2. Photo by Bob Black. The trail heading toward Silver Zone Pass. Photo by Bob Black. 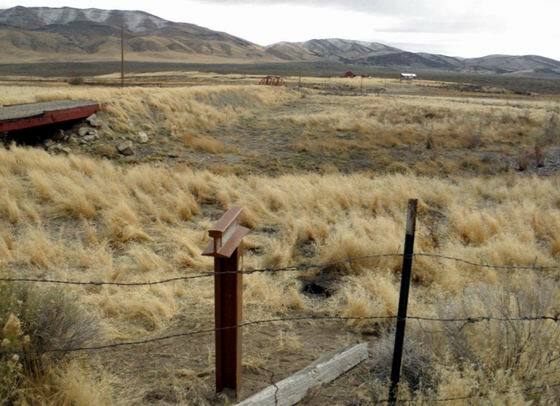 Marker HN-3, located on the edge of old Highway 40 a short distance east of the Pass, is directly above the trail and the spring located in the bottom of the ravine. 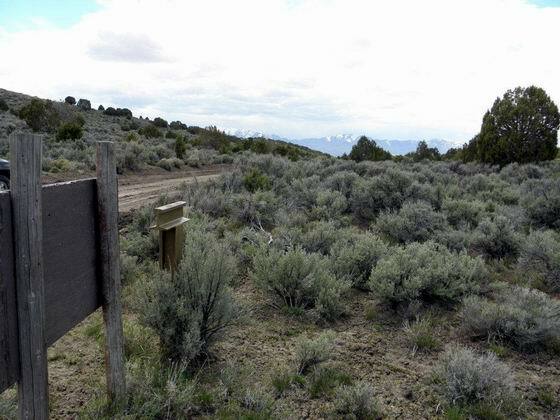 This section of used trail heads south from Big Springs and is near Flowery Lake Spring and Marker HN-7. Photo by Jim Moorman. The trail route heads west toward Flowery Lake Pass. Photo by Jim Moorman. The trail crosses the Pequop Mts. at Flowery Lake Pass near Marker HN-8. 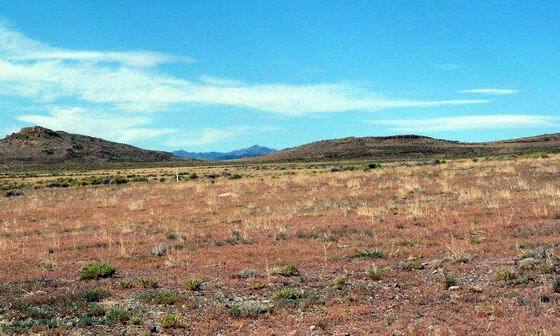 From the marker, the trail heads west, past the white Carsonite post, across Independence Valley and toward Mound Spring. Photo by Jim Moorman. 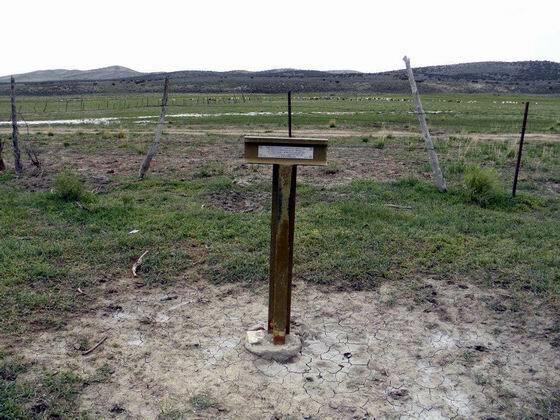 The emigrants stopped here to rest and water their livestock after crossing the dry Valley. This is a strange spring area where the ground flexes when you walk on it. The emigrants noted this in their diaries. Photo by Jim Moorman. 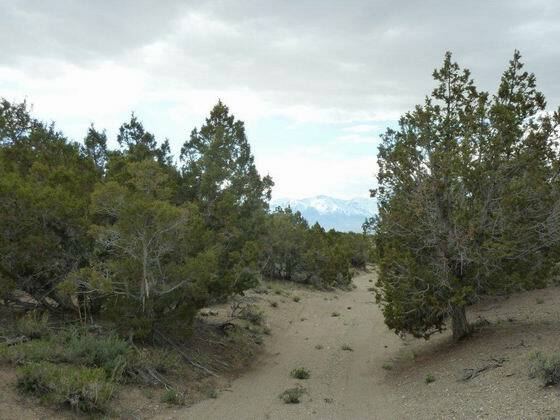 The trail, now a dirt road, heads west over Spruce Mt. Pass toward Marker HN-11. 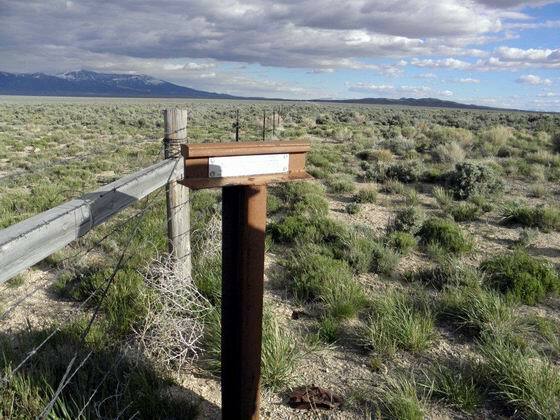 The trail passes Marker HN-11 and heads west across the valley toward highway 93 and Marker HN-12. Photo by Bob Black. 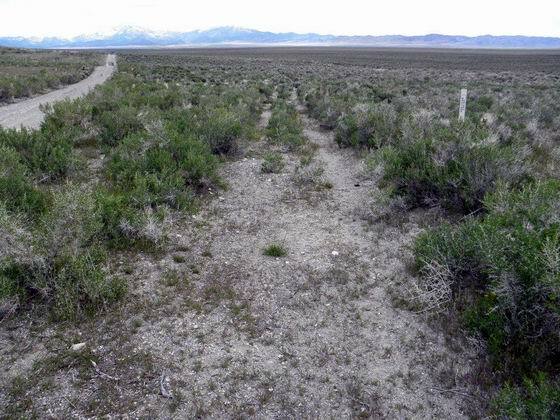 The trail route crosses over Highway 93 and heads southwest. Photo by Jim Moorman. 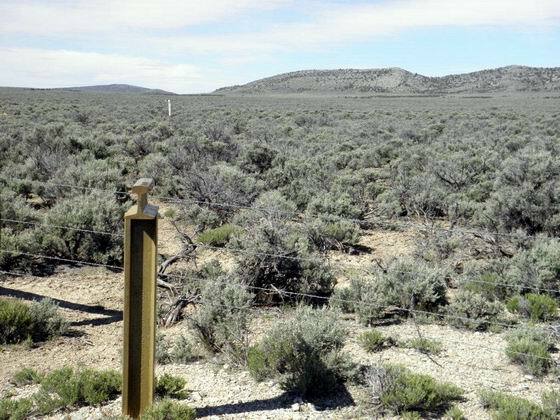 The trail, marked by white Carsonite posts, heads southwest past the marker across the sagebrush-covered slope toward modern Highway 229 and Marker HN-14. 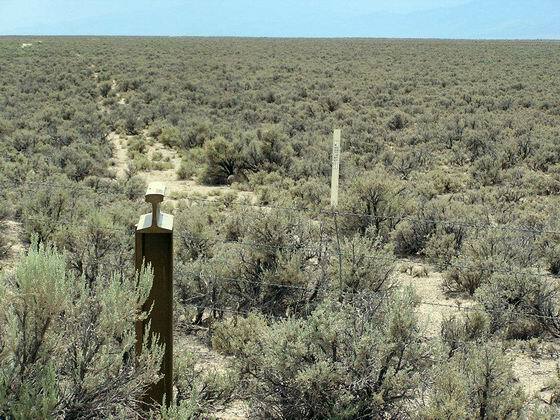 The original section of trail, back toward Highway 93 through the sagebrush, is marked by Carsonite posts. Photo by Bob Black. 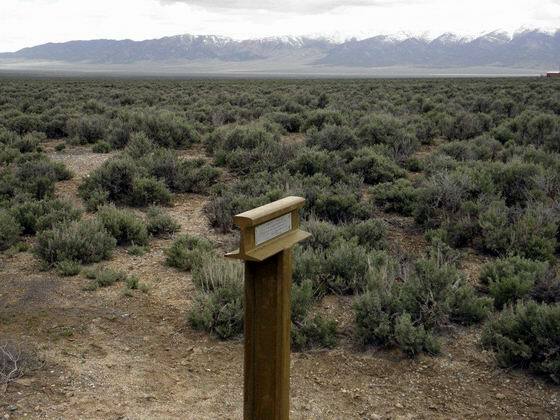 From the marker, the trail heads west across Ruby Valley toward Sulphur Hot Springs. Photo by Bob Black. 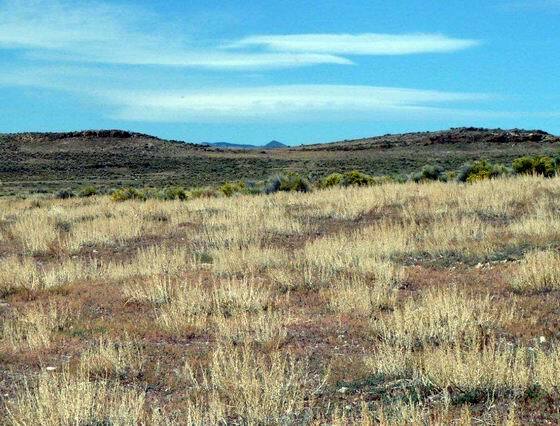 The trail route heads south along the flat ground, now an alfalfa field, along the eastern base of the Ruby Mountains. Photo by Bob Black. 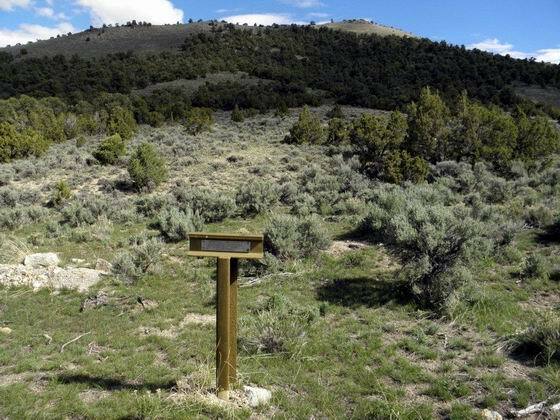 The marker is on the trail route along the base of the Ruby Mountains. 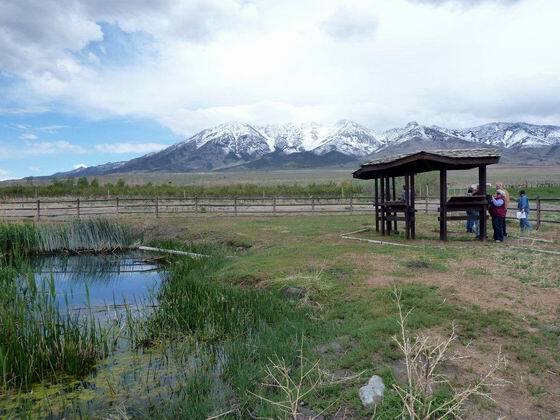 It is located near the headquarters of one of the earliest cattle ranches in Ruby Valley. Photo by Bob Black. 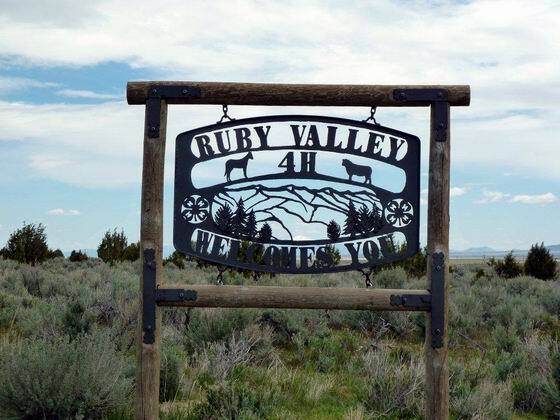 This sign is located along the county road and trail route through Ruby Valley. The trail route continues south past Marker HN-18 and along the bench between the valley and the toe of the mountains. Photo by Bob Black. 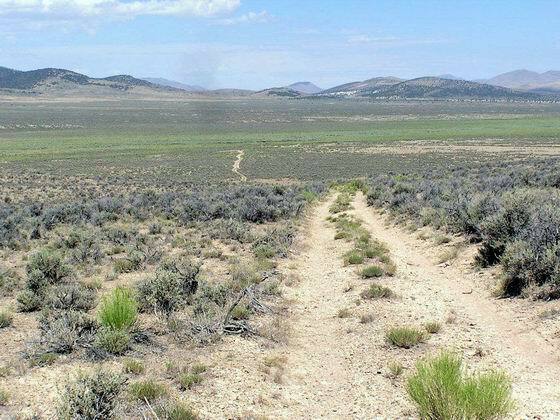 The Bidwell-Bartleson Pack Party of 1841 turned west and took a shortcut over this pass to Huntington Valley. Photo by Bob Black. 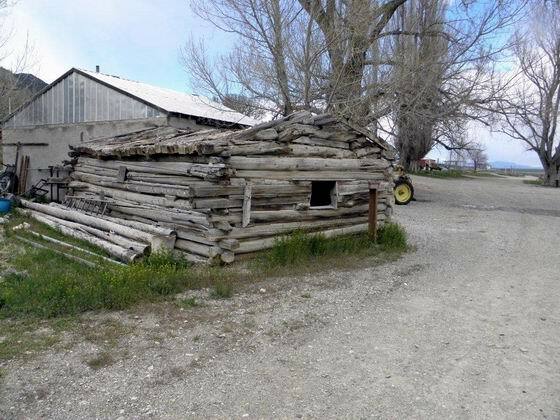 This cabin is typical of the cabins used by the early homesteaders in the Ruby Valley in the late 1800’s. Photo by Bob Black. 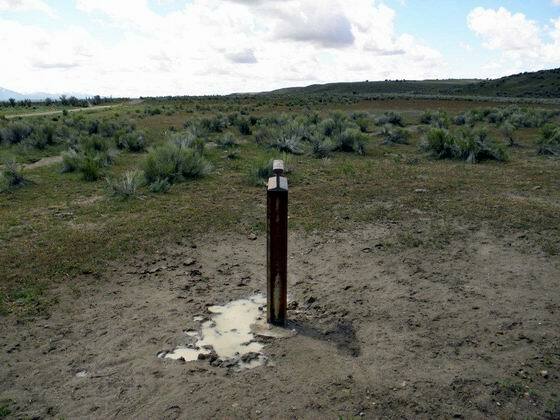 The marker is located on the lawn in front of the headquarters building for the Ruby Lake National Wildlife Refuge. Photo by Jim Moorman. 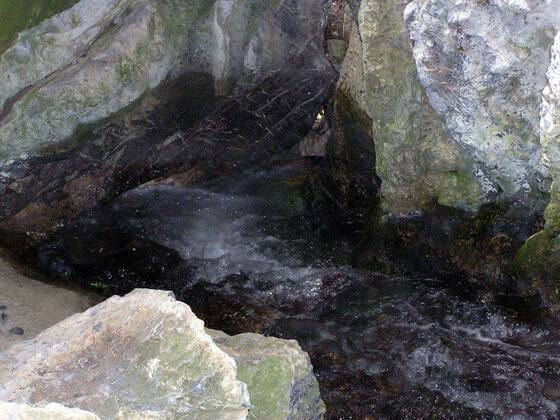 This clear, cold spring is the source of Cave Creek. It just pours out of the base of the mountain a short hike west from Marker HN-20. Photo by Bob Black. 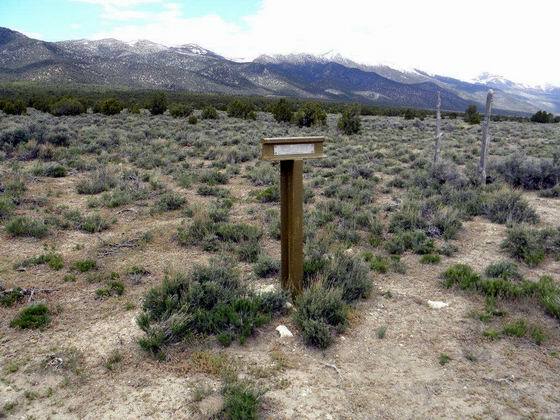 The later Pony Express Trail joined the Hastings Cutoff near Marker HN-21 and followed it west over Overland Pass. Photo by Bob Black. 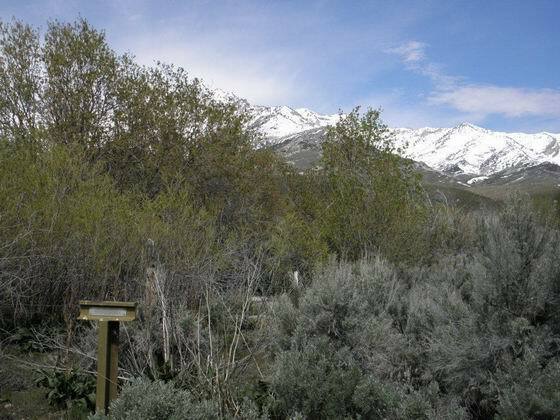 This view shows the trail route along the west side of Ruby Valley at the foot of the Ruby Mountains. Photo by Bob Black. 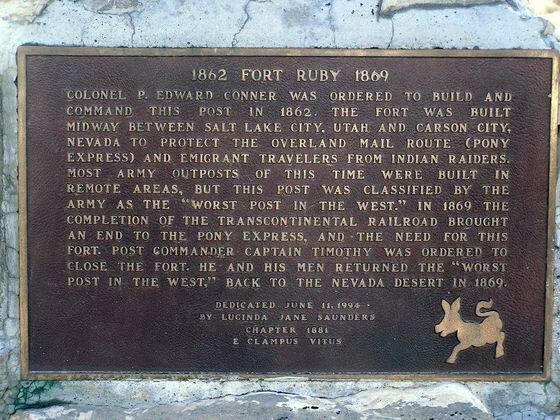 This plate gives the history of the old fort located near this site. Photo by Bob Black. 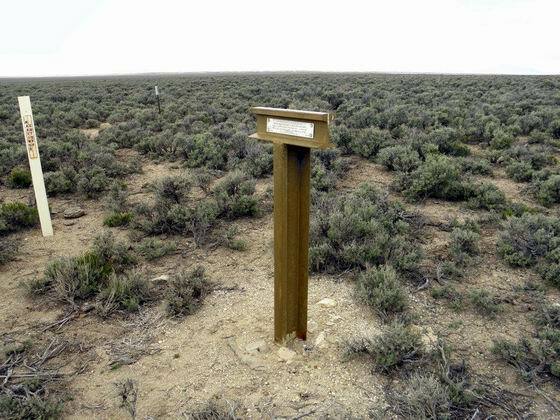 Marker HN-22 is located at the pass along the route of the Hastings Cutoff and the Pony Express trail. Photo by Jim Moorman. 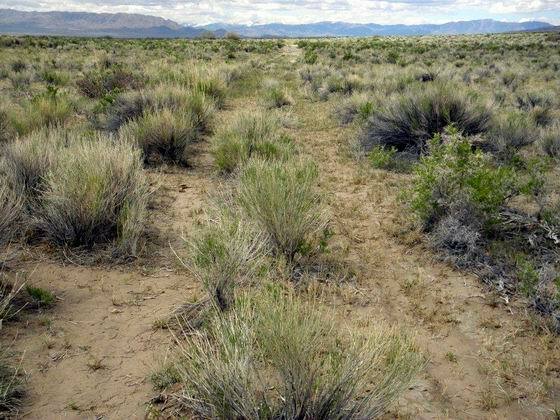 The trails branched here – the Hastings Cutoff headed north and the later Pony Express Route continued to the southwest. Photo by Bob Black. 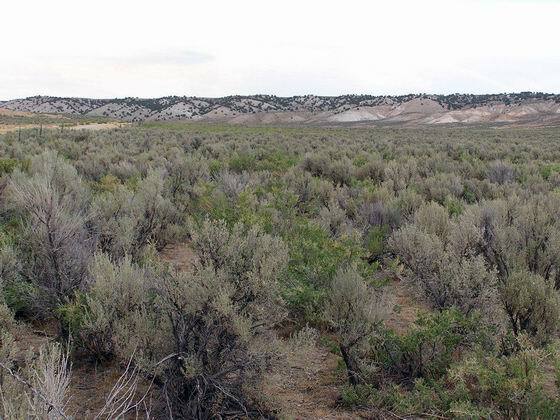 The trail, now a dirt road, heads northwest across the sandy, sage-covered terrain. 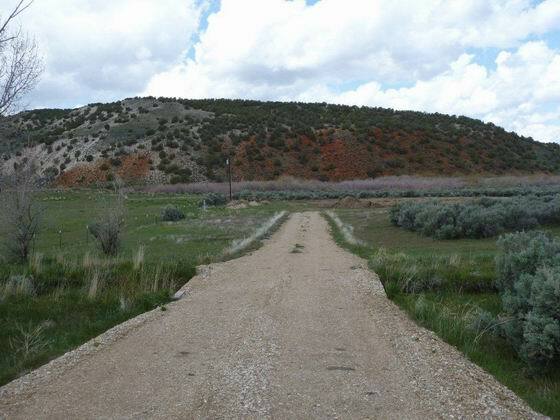 This view is looking southeast down the old dirt road from Marker HN-25 about 8 miles north of Marker HN-24. Photo by Bob Black. Marker HN-26 is along the trail route in the bottom of Huntington Valley. Marker HN-28 is along the trail route and the creek but about 20 miles farther north from HN-26. Photo by Jim Moorman. 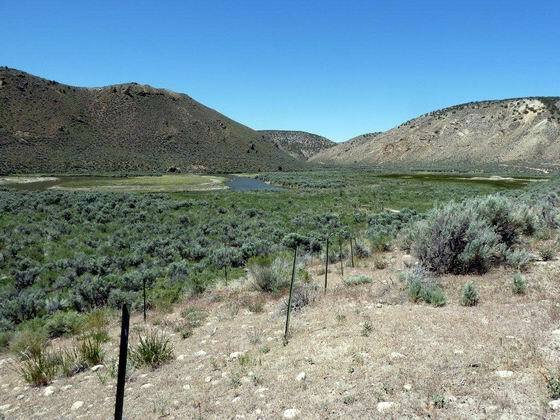 The Huntington Creek Valley is beginning to narrow down and the hillsides are now covered with sagebrush instead of grass. Photo by Bob Black. At this location near Marker HN-30, Huntington Creek empties into the South Fork of the Humboldt River. Photo by Bob Black. 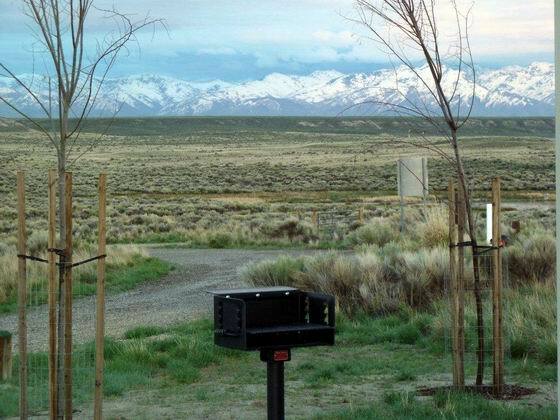 This scenic, modern campground is located about 4 miles north of Marker HN-30 on the route to Marker HN-31. It even has showers with hot water! Photo by Bob Black. A short distance north of Marker HN-31, the trail route enters the first section of the canyon of the South Fork of the Humboldt River. Photo by Bob Black. A solitary white pelican. Is it fishing or sunbathing? Photo by Bob Black. 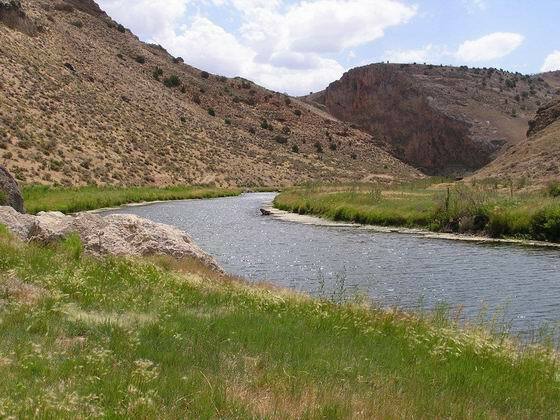 At the marker, there is a very scenic view up the river to the west end of the first canyon of the South Fork. Photo by Bob Black. 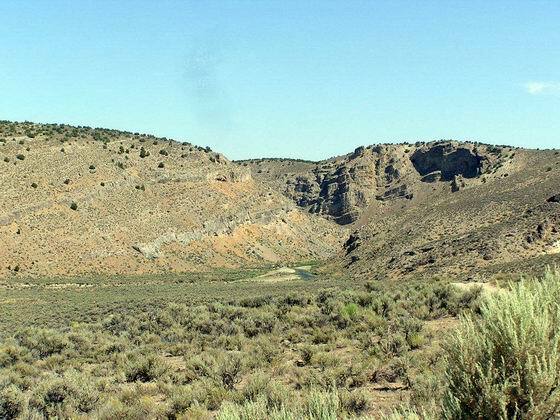 About 2 miles north of Marker HN-32, the river enters the second canyon of the South Fork. Photo by Bob Black. This scenic view is up the river from Marker HN-33 toward the west end of the second canyon of the South Fork of the Humboldt River. Photo by Bob Black. 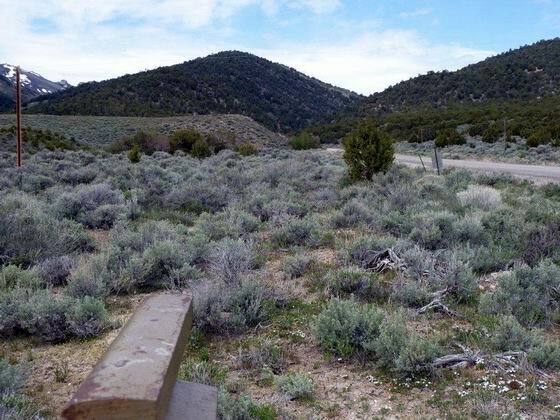 This is the view east to the mouth of the South Fork Canyon from the east side of Interstate 80 near the BLM Trail Interpretive Center at exit #292. Photo by Bob Black. 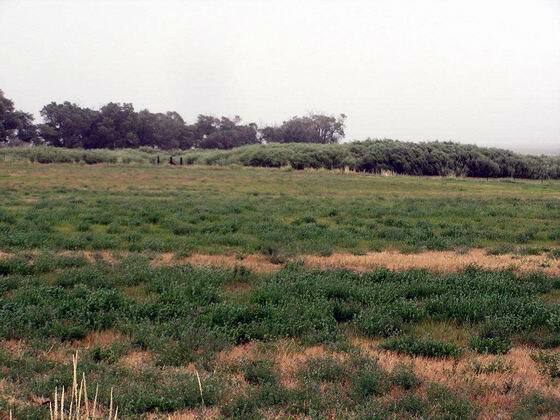 This is the end of the Hastings Cutoff where it joined the California Trail and continued on to California. The actual intersection is about 100 yards east across the Humboldt River. 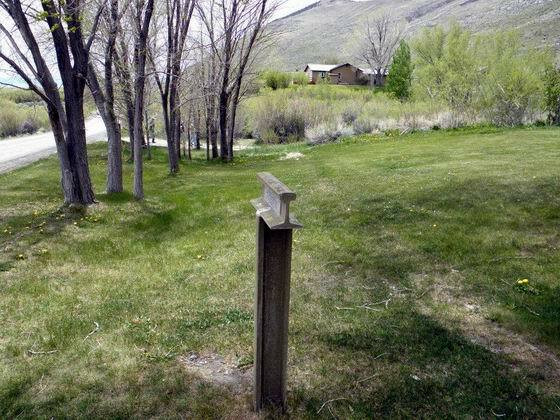 The marker was placed here rather on the other side of the river since the private bridge over the river is unsafe to cross. Photo by Jim Moorman.